Subroutines are called at the latest possible moment in the dialplan, so that the maximum of variables have already been set: this way, the variables can be read and modified at will before they are used. If you want to add a new subroutine, we propose to edit a new configuration file in the directory /etc/asterisk/extensions_extra.d. You can also add this file by the web interface. Subroutines should always end with a Return(). You may replace Return() by a Goto() if you want to completely bypass the XiVO dialplan, but this is not recommended. To plug your subroutine into the XiVO dialplan, you must add myexample in the subroutine field in the web interface, e.g. Services ‣ IPBX ‣ PBX Settings ‣ Users ‣ Edit ‣ tab General ‣ Preprocess subroutine. 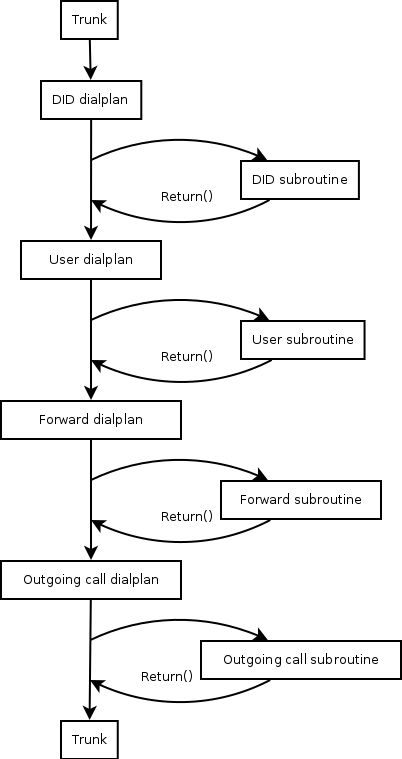 You can also use a global subroutine for call forward. XIVO_CALLOPTIONS: the value is a list of options to be passed to the Dial application, e.g. hHtT. This variable is available in agent, user and outgoing call subroutines. Please note that it may not be set earlier, because it will be overwritten. This variable is used by xivo-agid when selecting the ringtone for ringing a user. This variable is available only in user subroutines. XIVO_DSTNUM: the value is the extension dialed, as received by XiVO (e.g. an internal extension, a DID, or an outgoing extension including the local prefix). This variable is available in all subroutines. XIVO_GROUPNAME: the value is the name of the group being called. This variable is only available in group subroutines. XIVO_GROUPOPTIONS: the value is a list of options to be passed to the Queue application, e.g. hHtT. This variable is only available in group subroutines. XIVO_INTERFACE: the value is the Technology/Resource pairs that are used as the first argument of the Dial application. This variable is only available in the user subroutines. XIVO_MOBILEPHONENUMBER: the value is the phone number of a user, as set in the web interface. This variable is only available in user subroutines. XIVO_QUEUENAME: the value is the name of the queue being called. This variable is only available in queue subroutines. XIVO_QUEUEOPTIONS: the value is a list of options to be passed to the Queue application, e.g. hHtT. This variable is only available in queue subroutines. XIVO_SRCNUM: the value is the callerid number of the originator of the call: the internal extension of a user (outgoing callerid is ignored), or the public extension of an external incoming call. This variable is available in all subroutines.